The English polymath scientist Thomas Young (1773-1829) studied languages, medicine and physics and his name is immortalised in a series of experiments showing the interference of waves. He presented his work on the wave nature of light to the Royal Society in 1803. 1. Young’s double-slit experiment applied to the interference of electrons by Jönsson (1961). 2. Galileo’s experiment on falling bodies (ca. 1590). 3. Millikan’s oil-drop experiment (1909). 4. Newton’s decomposition of sunlight with a prism (1665–1666). 5. Young’s light-interference experiment (1803). 6. Cavendish’s torsion-bar experiment (1798). 7. Eratosthenes’ measurement of the earth’s circumference (ca. 250 BC). 8. Galileo’s experiments with rolling balls down inclined planes (ca. 1608). 9. Rutherford’s discovery of the nucleus (1911). 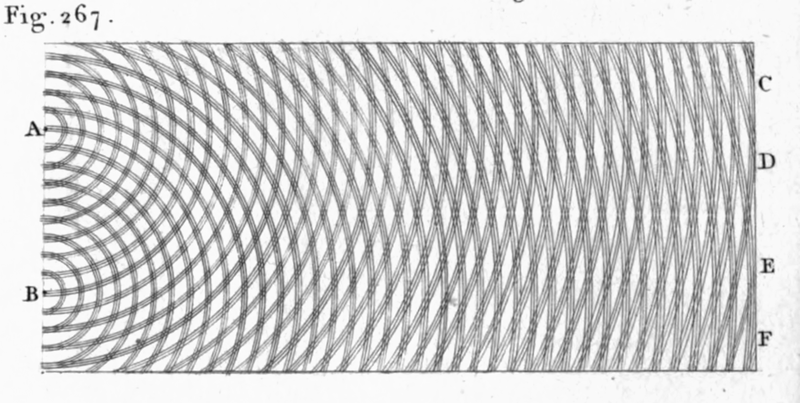 From Volume 1 is Thomas's description of a ripple tank demonstration of interference in water waves. Many of the phenomena of waves may be very conveniently exhibited, by means of a wide and shallow vessel, with a bottom of glass, surrounded by sides inclined to the horizon, in order to avoid the confusion which would arise from the continual reflections produced by perpendicular surfaces, the waves may be excited by the vibrations of an elastic rod or wire, loaded with a weight, by means of which its motions may be made more or less rapid at pleasure; and the form and progress of the waves may be easily observed, by placing a light under the vessel, so that their shadows may fall on a white surface, extended in an inclined position above. In this manner the minutest inflections of the surface of the water may be made perfectly conspicuous. Fig. 267. Two equal series of waves, diverging from the centres A and B, and crossing each other in such a manner, that in the lines tending towards C, D, E, and F, they counteract each other's effects, and the water remains nearly smooth, while in the intermediate spaces it is agitated.